Since my TBR bookcase is getting a bit of out control I decided to dedicate one day a week to a review from a book off that shelf. This was inspired by Kimba at Caffeinated Book Reviewer after I participated in her March TBR Challenge. Today's book is book 4 in the Royal Spyness series. I have 5 and 6 waiting on me! Description: Georgie (34th in line for the throne) is on her last dime when her brother Binky and his hateful wife Fig show up in London. Luckily the Queen sends her to a remote castle in Transylvania to represent the family in the wedding of Georgie's old school friend Matty. The castle looks like something out of a horror story, Matty is found with what looks like blood dripping down her chin, a mysterious stranger is seen lurking in the castle and one night at dinner an important but hateful guest falls dead after drinking a toast. It's up to Georgie to make sense of it all. Pro: This is easily one of my favorite mystery series right now. I love the back and forth between Georgie's aristocratic background and what is expected of her against how little money she actually has. She's a smart resourceful character without being too perfect. I loved the different setting in this book. The history and atmosphere of Transylvania along with some of the tensions between the local royal families was a nice little shakeup to the series. The introduction of Queenie provides some comic relief and was an interesting look into how ladies' maids are supposed to behave (or in her case shouldn't behave). Normally the idiot police detective is one of my pet peeves but in this case it worked very well. Con: I could have done without Belinda and Georgie's mother in this book. I very rarely like her mother and Belinda came off as unusually shallow. They seemed like unnecessary annoyances in this one. I really want a happy ending for Georgie and I want it to come now but that's strictly my love of unrealistic happy endings. I wish there had been a few more clues to the mystery throughout the book as the end did feel a little rushed. 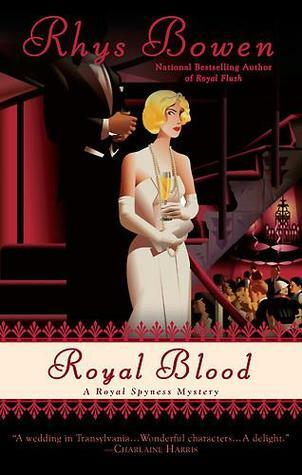 Overall: I love pretty much everything about this series - the time period (between the Wars), the characters and the royal connection. I'm always worried every time I start a book in a series that I enjoy that the new book will disappoint. So far Bowen has yet to disappoint. This is a fun and unique series that stays light and entertaining without falling into the trap of being too silly. Would I Read More of this Series/Author? : Yes I have the next 3 in this series waiting for me and I'm looking forward to reading them. I'm not familiar with this series, but I have heard of the author at least. This sounds like a great mystery series. I shouldn't be given my TBR collection, but I'm always on the look out for mysteries! I'm the same way when it comes to mysteries! I've really enjoyed this series so far. I think her other series is a bit more serious while this is definitely more lightweight but still not silly. Good luck working on your TBR! Thanks! It'd probably help if I didn't continue to add to it but I can't figure out how to stop!